Remi has been doing so fantastic in his shoes with the fill in pads. I intend to get him barefoot again but with all the rain we had last summer he wore his feet off too fast. His hooves have been tough and without flair on his holistic horse health program of di magnesium malate, packets of bluegreen algae, enzymes and probiotics and chia seeds. I had had Remi on magnesium oxide for over a year and it helped his feet but when I switched him to the more easily absorbed di mag he did even better. The chia seeds have made a huge difference in his coat. He not longer gets the dry skin and bare spots on his forehead and face. The essentials support his digestion and vitamin/mineral needs. In the last few weeks I noticed that Remi was not looking as good as he had and when I took him for a lesson with Linda Hoover she commented that he seemed more sore in his hindquarters. I do body work on Remi often but I tend to focus on his chronic shoulder issues and decided to have him looked at for any new injury. Sure enough, my colleague, Luann Groves at Whole Horse Clinic in San Marcos, TX, was able to find a displaced bone in the base of his tail and a recent sacrum injury. This explained Remi’s reluctance to go downhill. 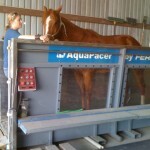 We were able to get him adjusted and Dr. Groves suggested we follow up the treatment with some swim therapy. Remi loves water so he was thrilled. 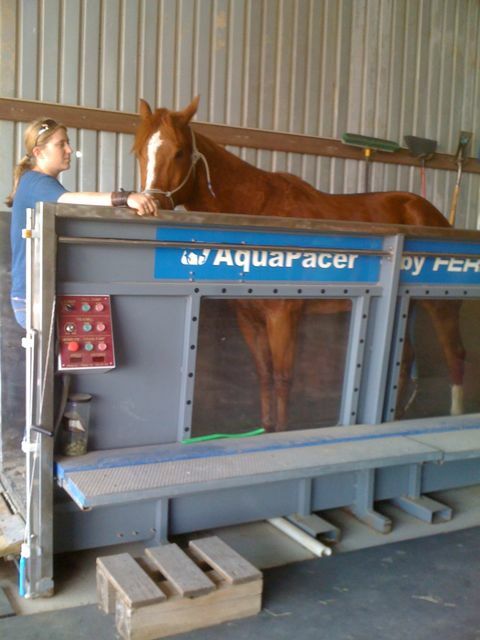 The aquapacer allows the horse to exercise injured areas in a controlled way. I like it much better than regular swimming because the horse does not extend his back as he does when he swims. As a matter of fact the horse raises his back as he steps through the water. Walking through the knee high water causes nice movement in the sacrum area and other areas can be worked depending on the depth of the water. This entry was posted in Cerise & Remi, General Horse Care, Horse Health Care and tagged holistic horse health on March 11, 2011 by Madalyn Ward, DVM. Photos courtesy of Kat Netzler The Chronicle of the Horse and Sam PooleThis past weekend wrapped up our winter eventing season down south with the Southern Pines II horse trials in North Carolina. I rode three horses in the advanced my usual rides Benwald and Remington and a catch-ride called Isabella II pictured below right photo courtesy of Kat Netzler The Chronicle of the Horse who is usually ridden by Susie Beale but Susie was undergoing knee surgery so I was fortunate to get the ride this weekend to keep her going since Susie is planning to take the mare to Kentucky. He got 4s on the medium to extended trot and the horse didnt do anything wrong – for a four Id think hes be tossing his head or really acting up. This got me thinking about how important it is to know our horses and keep track of even minor changes in their management and any resulting effects. Another horse might have had no problem at all with the feed change or even benefited as I though Cerise would. Here are a few areas where I feel we should get to know our horses well. by Mon Mar 17 2008 12 52 pm ……… This is from the March 2008 Holistic Horsekeeping Mid-Month Newsletter written by Doctor Madalyn Ward ..Remi Shows His Yang Ming Character. .Remi is my 11 year-old Yang Ming QH gelding. Cerise on the other hand thought the goats were some kind of horse-eating aliens.